ShareX is a screenshot grabbing tool with an impressive range of video and image editing tools. Once a file is saved, the software offers a range of filters, editing options and upload tools to rapidly share any number of files. With such a range of tools available, it can seem daunting to get a handle on ShareX. While simple saving and sharing can be done fairly simple, understanding everything else takes time. Saving images or videos can be done in any shape from a full screen to a custom free hand, watermarks applied in any level of opacity or shape. New images can be created with the built in creation tools and then applied to any number of purposes. For a free and open source project, with a surprisingly light performance, ShareX goes above and beyond. 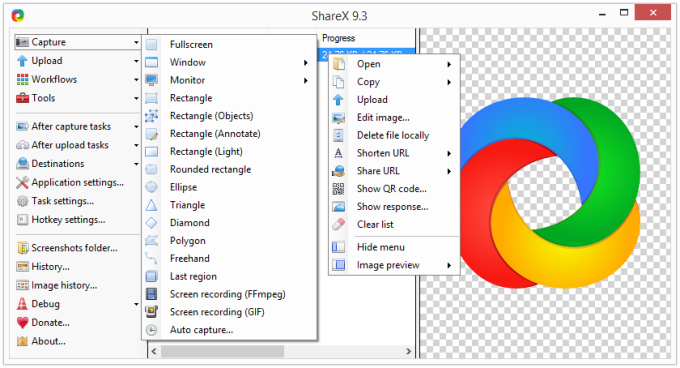 Comparing favourably with expensive alternatives, ShareX is a great option for a screenshot program. Advanced users will appreciate the extras and huge number of hot keys while others may only use it for its most basic features. If you have the need to rapidly edit and share video or image screenshots for any reason, keep this piece of software in mind. ShareX is an open source program that lets you take screenshots, save them in your clipboard, hard disk or upload them to over 25+ different remote locations. ShareX can capture screenshots with different shapes: rectangle, rounded rectangle, ellipse, triangle, diamond, polygon and also free hand. It can also upload images, text files and all other different file types. It is able to capture screenshots with transparency and shadow. The program also supports drag n drop and clipboard upload. Peoples who need to take screenshot with a single key to instantly save and upload them. Be able to upload files to over 25+ different remote locations. What do you think about ShareX? Do you recommend it? Why?